Want the scoop on how to get perfect lips (sans Kylie Jenner level injections)? After testing out a million different product combos – seriously – I’ve discovered the formula for the perfect pout. Read on for my findings and get ready for the best lips of your life! First thing’s first: A trusty lip scrub is an absolute must. Prep your lips using an exfoliating lip scrub. It’s super easy to make your own with a combination of coconut oil and sugar, or you can be lazy like me and purchase one. I think the best lip scrub is LUSH’s Bubble Gum Lip Scrub, but there are several out there on the market that will get the job done. I take it a step further by using the Bliss Pout-O-Matic lip-perfecting device for maximum exfoliation. A toothbrush or your finger will also work btw – I’m just an overachiever. You can obviously do this anytime, but I incorporate this step into my nighttime skincare routine to prep for the most effective beauty sleep. Once you’ve scrubbed thoroughly, slather on a lip mask like Kaplan MD Lip 20 Peppermint Mask. This soothing gel mask gently removes chapped, flaky skin using papaya enzymes, while hydrating and repairing the delicate skin on your lips with marine collagen and hyaluronic acid. So, if the scrub left anything, rest assured this will get it taken care of and then some. It plumps the contours of the lips seamlessly and will leave them feeling and looking fab in 5 minutes or less. It’s imperative to also make sure you’re hydrating your lips after you’ve exfoliated. So as the last step before bed, break out the Laneige Lip Sleeping Mask and let the miracles continue while you get your beauty sleep. It’ll feel like a super thick lip balm in the best way. Apply an ample amount and let the magic happen. Good morning, beautiful! At this point, you’ll wake up with amazing lips. However, don’t stop the hydration train just because you’ve woken up and look amazing. 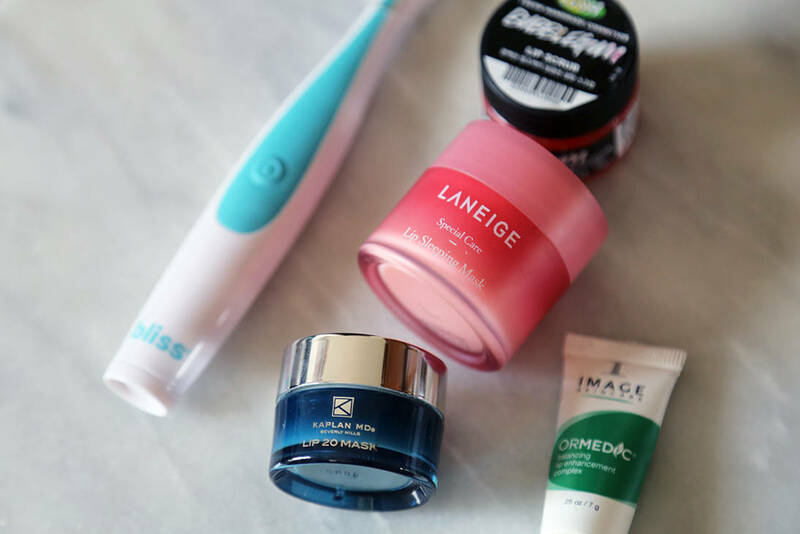 I keep several tubes of Image Skincare’s Ormedic Lip Complex scattered around my apartment, in my desk, my makeup bag, my purse… you get the picture. Get some and use it throughout the day to maintain that perfect pout. I swear to you, if you follow these steps your lips will never look better. Promise. Muah!